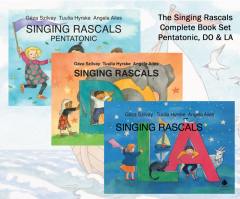 All 3 books from the Singing Rascals series by Géza Szilvay. The First Book in the Colourstrings Singing Rascals Series. The Singing Rascals Do book for younger children staring Colourstrings. The Singing Rascals La book for younger children staring Colourstrings. 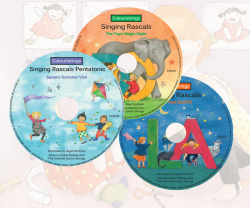 Singing Rascals Pentatonic CD - Beautifully read story to accompany the book including children playing and singing all the songs. Singing Rascals DO CD - Beautifully read story to accompany the book including children playing and singing all the songs. Singing Rascals LA CD - Beautifully read story to accompany the book including children playing and singing all the songs.